The Peas in our Pod » easter sunday, etc. At about 7:15 am Dave and I heard Nezzie yelling, “Mommy, Daddy!! Mommy, Daddy!! Look what I found! !” She was so excited and I said to Dave, “Aww, she must have found the jelly beans in her shoes.” *This is a Kewish tradition that may or may not be explained in a later post. * So Dave got up and went to her room, where she was NOT found. No, no. Our little one had VERY quietly gone downstairs and found her easter basket all by herself. By the time we got to the top of the stairs to join her, she was yelling, “Mommy, Daddy! I found toys and peeps!! !” I could not get mad at her, she was so excited. But as a result of rushing downstairs to catch some sort of a glimpse of her discovery, we have no Easter morning pictures. 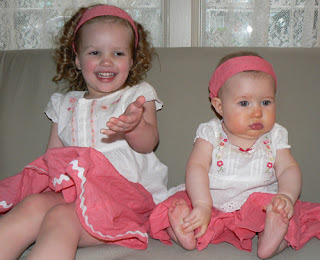 However, here are a few pictures of the girls in their Easter outfits. I made the skirts and Gwen’s headband, my Mom made Nezzie’s, and I bought the shirts at Target. I’m pretty proud of myself, as long as I don’t look closely at Gwen’s waistband. We had nummy Easter dinner with Mom & Dad Kewish, and Uncle Jon & Aunt Ashley, followed by a rousing game of Facts in Five. And of course we ended the evening on a high note watching The Evil Easter Bunny. Tears freely flowed from my eyes as I laughed, hard. And while I remembered the best Easter weekend ever, when that cinematic masterpiece was born, I was reflecting and just feeling so lucky to be a part of the best family ever (no offense to you non-Kewish readers). Even with all of our crazy traditions and imperfections, I just love my parents and siblings more than I can express. I have been so blessed to have them in my life because they have taught me so much and love me unconditionally. They have added even more to this family by way of spouses (those crazy enough to marry into our family) and children and as a result my life has been enriched. So this Easter sunday I feel an immense gratitude for our Savior who died for us and made it possible to return and live with our Father in Heaven as eternal families. I couldn’t ask for anything more. Holly, what the heck is the Evil Easter Bunny? And, Nezzie looks like Shirley Temple with her cute hair and sweet outfit!! You did great on those skirts! The Evil Easter Bunny is only the best homemade movie ever. Oh…besides the one of us in Hawaii that I never want to see again. We made it my freshman year, and it starred Joe, Jack (remember Joe’s friend we took the b&w pictures with? ), Kristy, Vaughn and myself. And it was one of those things that just happen late at night, when everything is funny and you are hopped up on sugar from all the Easter candy you’ve been eating all day. I’ll have to show you the next time I see you. It’s a cult classic—and by cult I mean Joe, Jack, Kristy, Vaughn and myself. how did you make their headbands? nezzie’s is hot glue-gunned to a plastic headband, and i just sewed some fabric together and put elastic in gwen’s. They look great. When are you going to make Tori an outfit;)? 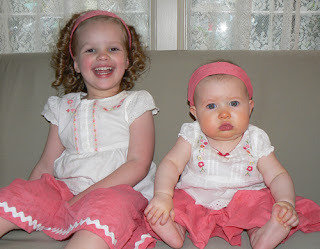 Your girls look adorable in thier Easter frocks. You did a super job!! I loved dressing my middle boys like twins when they were younger too!! Darling little gals and fancy pink skirts! I love it! Oh Holly! They look SOOOO cute! And, I laughed when I read the part about her getting so excited about PEEPS!! LOL I completely forgot about the jelly beans in the shoes this year. I’m a loser. ps…I could have SWORN I did not see this post here this morning…buggar. love it! gwen is t.d.f. grabbing her little feet! Holly, thanks for the sentiments about your/our family. Dad and I know that we were sent ‘good ones.’ Because, in spite of what we did or didn’t do, you all turned out TERRIFIC and making the most important decision of your life–chose TERRIFIC ones as well. And, when I think of 18 additional “perfect” ones–I cannot give thanks enough. Being a part of everyone’s lives is an honor. I must go now–lump in throat.